A senator and three members of parliament were today arrested by Criminal Investigation officials in Nairobi after being required to write detailed accounts regarding a peaceful demonstration that turned ugly when police opened fire, killing at least one person and injuring scores of others in Narok County. Interior Cabinet Secretary Joseph Nkaissery–himself a Maasai–has said punitive action will be taken against MPs Moitalel Kenta (Narok North), Korei Lemein (Narok South), Patrick Ntutu (Narok West) Johana Ngeno (Emurwa Dikir) and Senator Stephen ole Ntutu who led the demonstration to protest the manner in which Governor Samuel Tunai is running the affairs of the local county. A memorandum the officials planned to submit to the Governor includes claims that the World famous Maasai Mara Game Reserve no longer serves the public because it is being exploited by the Governor and the Kenyan ruling elite. The memorandum contains an array of allegations ranging from the Governor using a private army to protect himself and the Oloololo Game ranch that he illegally acquired from the Siria Maasai, and misappropriation of billions of Kenya shillings through dubious contracts including one that was awarded to a firm that the governor and various other leading political elites in Kenyan are associated. Available investigative reports indicate that the Governor is not only accused of misappropriation of public funds but in order to cement his strength in one of the wealthiest counties in Kenya, he hires selected individuals in newly-created positions of employment–something that is unconstitutional–with the support of government officials who are said to receive huge monthly perks. These mafia-like activities have mostly been articulated by the Governor’s former colleagues at the National Intelligence Service where he served before venturing into politics. The National Intelligence Service actively works on the Governor’s behest and they are used by senior government officials to collect intelligence reports on possible threats and to plan how people can be framed by the police on trumped-up charges. The most striking issue here is that, despite the Maasai members of parliament having raised serious issues affecting their county with the president, officials from the Ethics and Anti-corruption Commission opted to carry out a public audit rather than a forensic audit as requested by the Maasai. This is just one of the many cases where continued systemic marginalization, exploitation, intimidation and expropriation of Maasai resources by the political elites in cahoots with local gate-keepers has continued to deprive the Maasai of their democratic right to self-expression, association and assembly. It is also a blatant attack by the government on the basic rights of the citizens of Kenya contrary to both the Kenyan Constitution and international instruments on human rights. The Maasai in Kenya are under siege due to the abundance of resources and land that the government has appropriated through unethical, inhuman and unconstitutional means–the act of killing an innocent protester and arresting a group of officials being a clear attempt to intimidate the Maasai to prevent them from continuing to demand justice and accountability at the highest levels of power. 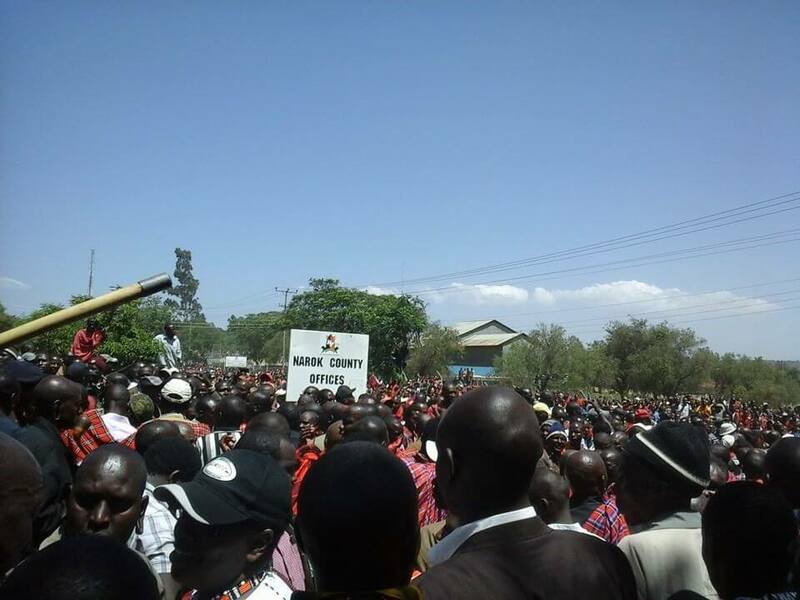 In response to the allegations, the Maasai in Narok County are demanding that the Governor provide a satisfactory explanation to each of the issues raised and assume responsibility for his government’s misdeeds. They are also demanding that the government live up to the standards of the constitution especially with regard to the proper management of public funds and resources–a cardinal requirement of the Constitution of Kenya. Calling for the government to promote constitutionalism, become accountable and transparent and ensure public participation, the Maasai are further demanding a formal response within the next 21 days; the failure to comply leaving the Maasai with no choice but to directly exercise the sovereign power of the people as bestowed upon them by the Constitution of Kenya. Given that the Maasai Mara Game Reserve is a world-renowned tourist attraction, the Maasai are calling upon anyone who visits the Mara to help fight this corruption by either boycotting the Maasai Mara or by calling for a stringent corruption-free system that offers them value for their money. As things stand now, all tourist payments to the Maasai Mara are like a curse to the Maasai who not only conserve the region’s flora and fauna but gave up their grazing land for the creation of the famous Game Reserve.